Las Posadas (Spanish for inn, lodging, or shelter) are an Advent candlelight procession and celebration re-enacting Mary and Joseph’s long, frustrating search for a place where Jesus could be born. The tradition reenacts the story told in Luke 2:1 – 7 but with a twist: a happy ending with the “innkeeper” welcoming Mary and Joseph into the home. It was in the 16th century that the Spanish missionary, Fray Diego de Soria, found himself trying to explain the story and meaning of Christmas to the Aztecs of Acolman, México. The missionary found it extremely difficult to explain the story of Jesus and His birth in a stable. Then, the answer came to Fray Diego de Soria. Why not let the Aztecs recreate in a ceremony the searching of Mary and Joseph for lodging on their journey and the birth of Jesus in the stable? This, then, was the beginning of “Las Posadas,” the custom of offering shelter to Mary and Joseph on each of the nine evenings before Christmas. The Spanish word “Posada” means lodging, inn or shelter. The first posada begins in the church on the evening of December 16th and goes for 9 days (novena). The people gather to pray and meditate on the joyous season ahead. Each person carries a lighted candle and the procession begins. The procession moves out of the church and into the streets of the neighborhood. The procession follows the Holy Pilgrims into the house and all pray in front of the “Nacimiento” or Nativity scene, which has been set up in a corner of the house. Then, the host and hostess for the evening serve refreshments witch usually consist of cookies and hot chocolate and “ponche”. The people sing special hymns as they make their way to the home of the innkeeper for that evening. At the house, the singers gather around the front entrance while someone knocks at the door. In Mexico and other countries, neighbors take turns hosting Posadas. Children, adults, and musicians play the parts of Mary and Joseph or carry statues of Mary and Joseph. Together, they go house to house as Christian pilgrims searching for lodging. Festive decorated clay or paper mache container filled with candies and hung from the ceiling. 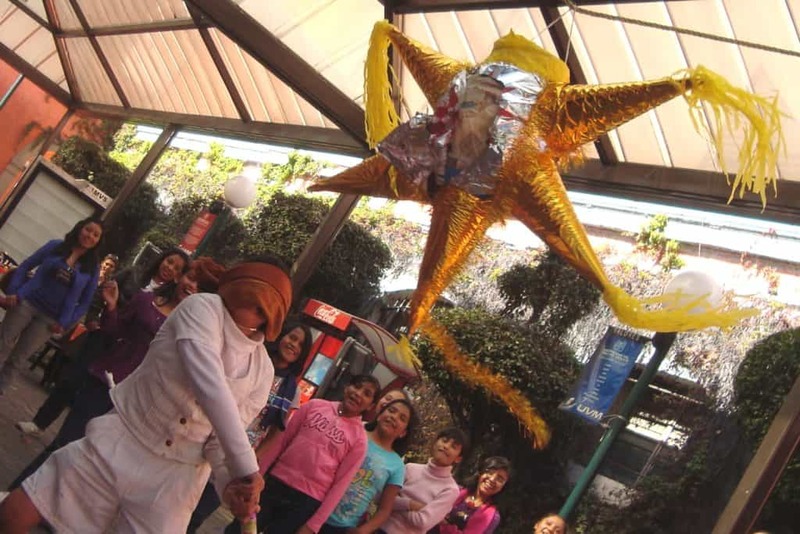 In some regions, the piñata, have the shape of a seven-cone star, and its cones represent sin, with garish colors and ribbons that tempt the soul. The blindfold that is placed on the children represents living or walking by faith alone. The children are blindfolded and take turns hitting at the “piñata” with a stick until it breaks. Then, all of the children scramble for the contents of the “piñata”. The breaking of the piñata is a symbol of triumphing over temptation. The falling candy illustrates the grace of God. Is your church holding a Posada celebration? Click here to share that information on our website.